Now, before delving into the lurid world of amateur fireworks, our legal intern Stan has informed us that the candy bar machine in the lunch alcove just ate his fiver—AND that it ought to be implicitly stated, in some sort of disclaimer-ish type way, that fireworks are a mature pleasure, best enjoyed by consenting adults, and pregnant people should consult their doctor, yada yada yada. Basically, in no way are we condoning the irresponsible use of such fireworks, and one SHOULD not do reckless sh*t on the 4th of July. Good. Now that we got that out of the way, let’s talk about the stupid, reckless sh*t one COULD do on the 4th of July. 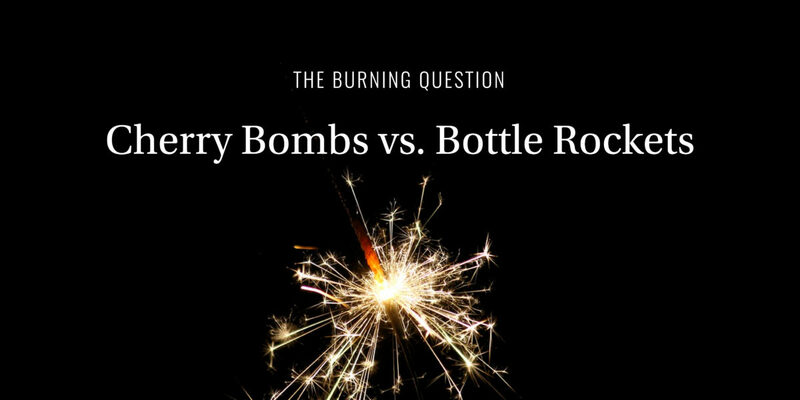 Specifically, as it pertains to the age old debate between two old favorites: cherry bombs and bottle rockets. And keep in mind, we will group with cherry bombs such delights as M-80s, quarter sticks, silver salutes, and other similar things that may or may not be illegal depending how close one lives to a rural interstate; bottle rockets will also encompass roman candles and other devices that whistle, zip up, and pop. First, the bottle rocket. Essentially, a small sky rocket with a guide-stick powered by black powder fuel and a nosecone that goes off in a burst of sparks. The concept is very old—similar rockets were being used in China in the 7th century, and they even figured in the first 4th of July celebration in 1777—but mass-produced bottle rockets as we know them have been around since the early 20th century. And although totally illegal in Canada, and some U.S. states (yes, we’re looking at you, New Jersey), they’re generally cheap and readily available. And their tubed cousins, roman candles, offer a rapid-fire alternative, as clearly demonstrated in the Wes Anderson classic Bottle Rocket, when the protagonists delight in firing them from a moving vehicle. Should you try this at home? No. Could you try this at home? No comment. And then, the cherry bomb. Essentially, anything powerful with a fuse you light and then run the hell away from before it goes bang. And they do have an interesting history—in their M-80 form, they were first developed by the U.S. military in the early 20th century to simulate artillery fire in training exercises. Hence, the loud boom. They were also given a boost in popularity by The Who drummer Keith Moon, who discovered the powder-filled devils when the band came to America, and who went on to do almost half a million dollars in damage over an eleven-year spree by blowing up hotel toilets while touring. Inspired in part by his antics, American youth began using cherry bombs to blow up mailboxes—although the cherry bombs they used were considerably less potent than the original version, which were toned-down following the Child Safety Act of 1966. Still, some continued to secretly manufacture illegal versions that were just as powerful. In fact, in 1983, one clandestine M-80 factory in Benton, Tennessee exploded and produced such a powerful shockwave, one neighbor mowing his lawn was thrown 70 yards through the air, and windows were rattled twenty miles away. In choosing between the two, while both are fun, we’ll go with cherry bombs. The history alone makes for some interesting grill chat, and the thrill that accompanies the lighting of the fuse is hard to duplicate, especially if you decide to twist multiple fuses together and light them all at once—which, Stan the legal intern has kindly reminded us, is something you should never, ever do. And while you’re at it, say no to drugs and stay in school. And don’t do anything even remotely as moronic as this.